While the 2019 Geneva Motor Show is in full swing, Nissan is turning its sights on the Work Truck Show in Indianapolis with the reveal of a new custom truck. It's called the Ultimate Work Titan and it is the third in a line of custom Titans built for charity as part of Nissan's Calling All Titans Campaign. The last Ultimate Work Titan we saw was designed for the Red Cross and this new example is built for and will be donated to Habitat for Humanity. 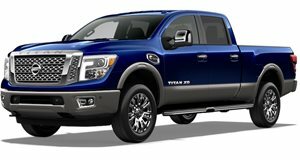 It's based on a stock Titan XD but is equipped with dozens of dealer-installed options to create the perfect work vehicle. The Ultimate Work Titan features a complete mobile office, toolkit, and off-road necessities. To create it, Nissan spent hours speaking with construction site supervisors and volunteers from Habitat for Humanity to find out what they needed from a truck. Through these conversations, Nissan developed three must-haves for the Ultimate Work Titan: off-road capability is a must, the interior should be treated as a mobile office, and the bed must be loaded with easy-to-access tools, ladders, and lockable storage. Starting with a Titan XD Diesel Crew Cab Midnight Edition, Nissan then added a factory-authorized Icon three-inch suspension lift kit with adjustable coil-over shock absorbers, custom rod end bearings, and patent-pending Delta Joints, which increase ride height and improve ride quality. The truck has also been equipped with Nitto Ridge Grappler tires, Icon Alloys Rebound wheels, Addictive Desert Designs bumpers, a Warn Industries Zeon Platinum 12-S Winch, and Baja Designs lighting. Inside, the mobile office is complete with a 13-inch laptop with a printer and a custom desk with file storage. When it's time to hop out of the truck to do some work, the Utili-track Bed Channel System features a lockable storage system for tools and additional lockable boxes on the sides of the bed. Inside the boxes, Nissan has provided a full toolkit including a table saw, chop saw, chainsaw, air compressor, and drill kit. When it is time to step back in the truck for a break, 14 cupholders will ensure everyone has a spot for their drink while they listen to a new Fender Premium Audio System. Nissan has donated more than 150 trucks and $16.9 million to Habitat for Humanity since 2005. This Ultimate Work Titan will be on display at the Work Truck Show in the Indiana Convention Center from March 6-8 before it is donated to Habitat for Humanity. You may not be able to buy one but the truck is meant to demonstrate what can be built using dealer-installed parts from Nissan.